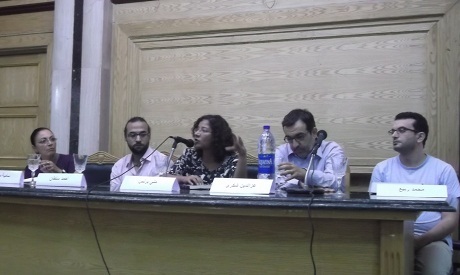 The fourth public lecture of the Summer Academy took place at Cairo University's Faculty of Arts on Wednesday, under the title “Literature and Revolution”, bringing various generations of writers together to discuss their work and how it was affected by events on the ground, becoming historical testimony. Novelist Elias Khoury started with a question about how literature relates to events: In confessional literature, the author takes part in the action and mixes personal observations with objective documentation, turning it into a literary text. The testimony of literature is different, representing the best view of historical events; it does not recount the event but puts it in context, using it as part of the structure of the literary work. "The moments of change have impact on literature, that itself becomes a testimony to the change; it reads the change by developing tools within novels to present them differently," Khoury explained, stressing that revolution is a path and urging the new generation of writers to continue being inside the event as citizens first, and present new visions for change. "Though I felt it was too early to write about the revolution in a creative context due to my belief that the revolution was still at an early stage and only a signpost for the change about to happen to Egyptians, I took the risk", Fishere testified. "In an environment of noisy political analysis, a novel was different, allowing the reader to live a different reality of the writer's choice. I spent 75 days living in the novel, surrounded by its characters and story, publishing it daily. As someone who is optimistic regarding the political long term, I found it difficult to create a happy ending that wasn’t also silly," Fishere concluded, stressing that even in a novel, there is hidden testimony in it. Mona Prince, a professor of English literature with published novels, completed a testimony on the revolution entitled My Name is Revolution. She started writing on 31 March 2011 and stopped in February of the following year, following the outcome of the constitutional assembly when things "started to take a wild turn". She wanted to document something, she says, although it wasn’t clear in what form: diary, blog or narrative. Prince started with a long introduction about the atmosphere prior to the outbreak of the revolution. Once the ecstatic upsurge was over, she recalls, she could see what lay beneath the surface and what nobody else wanted to see. "I was eager to document an episode of our history lest it be changed. That has already happened in statements by the Muslim Brotherhood that contradict what I saw." Mohammad Rabie, the young novelist and winner of the Sawiris Book Award, explained that his book, written before the revolution, is about the 30 years of Mubarak’s rule. In it he attempts to make the connection between the simple “man on the street” and “the Dragon”, as Mubarak is called. "I found it difficult to forge that link once I laid out the two interweaving lines of the story: the power line and the average-person line.” After nearly finishing the novel in January 2011, when things took the turn they did, he decided to give up the project. But in July 2011, he feared that the big wave of the revolution would break, giving way to the presiding apathy; he went back to the novel. Ahmed Sultan, a journalist and blogger with a degree in law who was an online radio anchor, put together a book about 100 characters whose Facebook statuses and notes he collected from the day Ben Ali fled Tunis to the day Mubarak stepped down. They are not important or famous people, but average individuals who wrote every day, and whose locations, opinions, styles and ages vary widely. "Those were individuals with open pages or open comments. And I did just as the security apparatus had done, watching them; eventually we requested their permission to use the material," Sultan explained. The idea was to make a documentary film, albeit in writing, trailing individuals as their positions and opinions changed. "It's purely documentary work," he insists, though some viewed it as literary art too.